Learn in this post what laws apply to drone pilots in Rwanda. All drones must be registered in Rwanda before the flight using form RCAA-Form-UAS001. Citizens of Rwanda can only make this registration with a minimum age of 21 years. The registration fee is 110,000 RWF (about 125 Euro). According to reports, the processing of the registration takes about three months. So if you plan to fly with your copter in Rwanda, you will need a local contact on whose behalf the drone will be registered. All other terms are very transparently explained on the website of the Rwanda Civil Aviation Authority (RCAA). Maximum Altitude: The maximum altitude allowed is 100 meters (328 feet) above ground. Maximum horizontal distance and FPV: The constraints include the maximum distance between pilot and drone of 300 meters, as long as direct visual contact is ensured. Compulsory insurance: A permit from the RCAA for copter flights can only be obtained in Rwanda if your drone is insured. Maximum take-off weight (MTOW): Drones in Rwanda can weigh up to 25 kilograms. Distance to airports: Without airspace clearance, flights within a radius of 10 kilometers (6 miles) around an airport are not allowed. Other safety distances: It is not permitted to have a side flight of less than 50 meters to persons, buildings, vehicles, ships, and animals unless they are directly involved in the flight. For flights over uninvolved persons, you need a special permit from the RCAA. Hours of Operation: Drone flights at night are not allowed in Rwanda. Special legislation: Drones must not fly faster than 100 kilometers per hour (87 knots). Drones must be marked with a number assigned to you by the Aviation Authority. The label may, e.g., via a permanent marker, a sticker or engraving. Good to know: The airports in Rwanda state that multicopters must be registered. That’s why you have to reckon with baggage checks that customs will ask you to register. 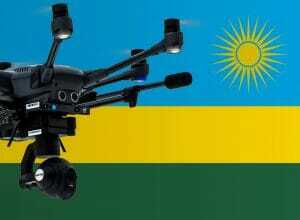 We have researched the listed drone regulations for Rwanda to the best of our knowledge. We cannot guarantee the correctness of the information. If you want to be on the safe side, contact the competent aviation authority. Alternatively, you can also ask the embassy in your country for further information about the regulations. Please leave us a comment when you receive news and/or gain experience with your copter in Rwanda!